Nothing beats a Hostess chocolate cupcake and a large glass of milk after a long day at school or the office. Except, of course, a homemade one! Instead of opening up a plastic package, try out these amazing, homemade cupcakes. They take a little time, but they are absolutely worth it. Get to work making these with the kids, or put them out for the next bake sale! Place the brewed coffee in a medium-sized mixing bowl. Whisk in the chopped chocolate and the cocoa powder until they are melted and completely combined. Set the bowl aside to cool in the refrigerator for at least 30 minutes. Preheat the oven to 350 F. Line a muffin tin with paper cups. In another bowl whisk together the sugar, flour, baking soda, and salt. Add the melted butter, eggs, vinegar, and vanilla extract to the cooled chocolate mixture and whisk until smooth. Gradually add in the flour mixture to the wet mixture and whisk until combined, but do not over mix. Divide the batter evenly among the muffin cups. Bake the cupcakes for 15 to 20 minutes, or until firm and just set. Cool the cupcakes in the tin for five minutes and then remove them and place them on a wire rack. Allow them to completely cool before filling and frosting. Prepare the marshmallow cream filling. Beat together the marshmallow creme, butter, and powdered sugar together in a medium-sized bowl using a hand mixer until completely smooth. Place the cream mixture into a pastry bag that is fitted with a large, round hole. Set it aside. Use a small round cookie cutter, about 1-inch in diameter, or use the bottom of a decorating tip, to cut holes in the top of each cupcake, cutting about 1/2-inch deep. Set the pieces of the cupcake aside, then fill each cupcake with the marshmallow cream until it reaches the top of the cupcake. Wipe off any excess cream. Set them aside while you make the other frostings. Make the ganache frosting. Place the chocolate chips in a medium-sized bowl. Heat the heavy cream on the stovetop until hot, but not quite boiling. Pour the heavy cream over the chocolate chips. Allow it to sit for a minute and then whisk the mixture until it is smooth and glossy. Allow it to sit for 2 minutes. Dip the top of each cupcake into the ganache frosting. Twist and remove the cupcake from the frosting and place on a tray or plate. Set the cupcakes aside to allow the ganache to harden, probably about 30 minutes. While the ganache is hardening, prepare the white icing. Whisk together the milk and powdered sugar until thick and completely combined. It needs to be on the thicker side in order for the curly cues to stay intact. If the icing is too thin, whisk in more powdered sugar. Place the icing in a pastry bag fitted with a small round hole. 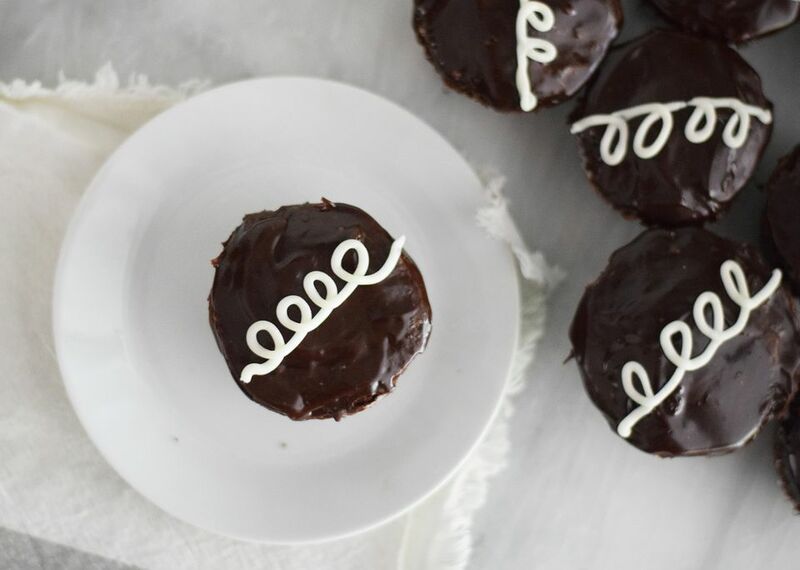 Once the ganache has completely hardened pipe the curly cue design onto the top of each cupcake. Serve immediately or place them in an airtight container until you are ready to serve.